Fecon introduces the Tier-4 compliant BHP270 Power Pack for larger excavators (20+ tonnes). 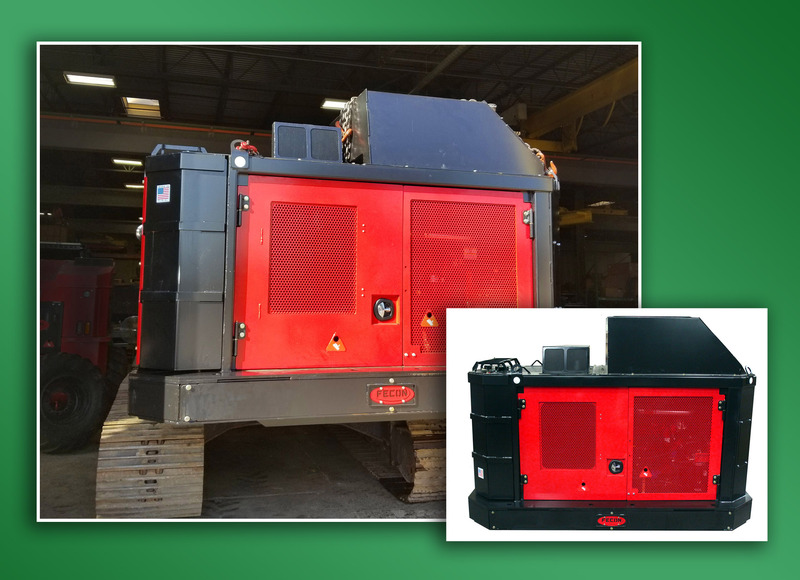 This independent power source provides additional hydraulic horsepower to operate attachments like the Bull Hog mulching head without hydraulic flow from the host machine. While excavators of this size typically provide 45-60 gpm, the BHP270 delivers up to 109 gpm of hydraulic flow for maximum power on the jobsite. This new fuel-efficient upgrade delivers a flatter torque curve for constant 270 hp output from 2000-2400 rpm, yet uses jut 7.7 gph at Duty Cycle. The Power Management microcontroller channels all power to the brushcutter, so there is no power loss due to accessories. This also improves engine response/recovery and sustained peak grinding power. New After Treatment (AT) components are located inside the dome on the roof, keeping AT heat separated from the engine bay. A larger fuel tank holds 91.5 gallons is sufficient for a full day of work. Other new design elements include a new firewall inside the engine compartment to keep airflow from the engine side separate from hydraulic side. All hydraulic components are now on the left side of the fire wall. Airflow direction on the engine is reversed from the previous version, with intake on the right rear door and exhaust out of the right side door.